CHARTER BUSINESS custom hosting faqs 2010 INTERNET. Q. How do I access my ? Q. How do I change or reset a password for an account? 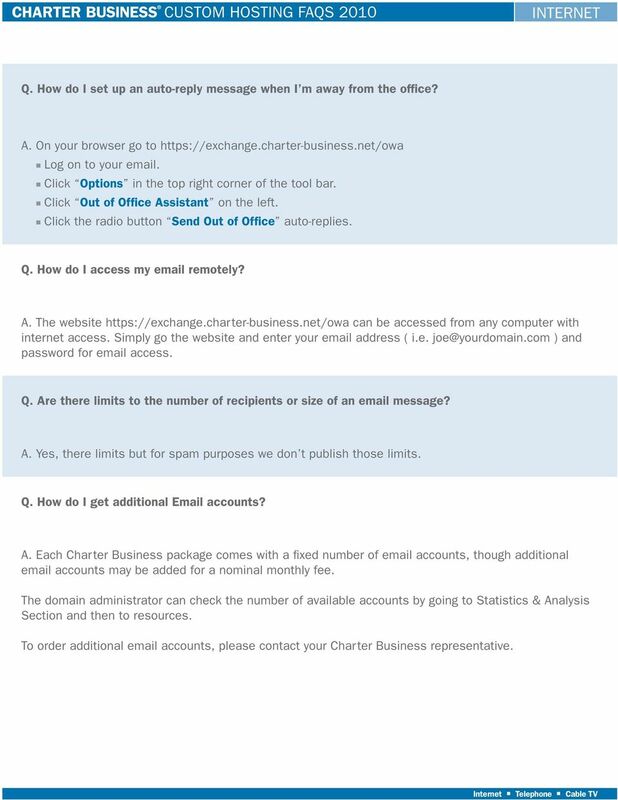 Download "CHARTER BUSINESS custom hosting faqs 2010 INTERNET. Q. How do I access my email? Q. How do I change or reset a password for an email account?" 2 Q. How do I access my ? Go to website and enter your address ( i.e. yourdomain.com ) and password for Outlook Web Access. Q. How do I change or reset a password for an account? Log into your account at and select Hosting > Configuration & Administration > Service Users. Next, select the user you wish to change by clicking on the display name for the user. Then, click the change password button. Type the new password twice in the password and confirm password boxes and click the submit button to confirm changes. Q. How do I forward or redirect my messages to a different address? A. Log into the Service User account (i.e. at Under Service Configuration > Exchange Mailbox click Forwarding. Click Enable. Enter the address you wish to forward all to then click Submit. 3 Q. How do I set up an auto-reply message when I m away from the office? A. On your browser go to Log on to your . Click Options in the top right corner of the tool bar. Click Out of Office Assistant on the left. Click the radio button Send Out of Office auto-replies. Q. How do I access my remotely? A. The website can be accessed from any computer with internet access. Simply go the website and enter your address ( i.e. ) and password for access. Q. Are there limits to the number of recipients or size of an message? A. Yes, there limits but for spam purposes we don t publish those limits. Q. How do I get additional accounts? A. Each Charter Business package comes with a fixed number of accounts, though additional accounts may be added for a nominal monthly fee. The domain administrator can check the number of available accounts by going to Statistics & Analysis Section and then to resources. To order additional accounts, please contact your Charter Business representative. 4 Q. How do I get additional storage and allocate unused storage to users? A. Each mailbox has a capacity based upon a package it is part of. You cannot increase the size of your mailbox, but you can upgrade to an Exchange Standard or Professional mailbox in order to get more storage space. Note: You cannot allocate unused spaces to other mailboxes. Q. Can I use a third party client to get my s? A. Yes please see third party instructions for details on how to set this up. 5 Q. How do I set up my custom account in Thunderbird, Apple Mail, Entourage, Outlook, etc? A. Login to your account at Next, click on the mailbox you wish to set up under its display name. In the mailbox section, click on the view setup info link next to IMAP4 or POP3. A new window will open which displays a walkthrough for clients such as Thunderbird, Apple Mail, Entourage and Outlook. Configuring Mozilla Thunderbird to Connect Mailbox via POP3 1. Launch Mozilla Thunderbird. 2. Click Create A New Account. The Account Wizard starts. 3. Click Account and press Next >. Fill out the form that appears: In the Your Name field, type in your name that will be shown to your recipients. In the Address field, type in (your full address). 4. Click Next > to continue the Wizard. Provide the following information about your incoming server: Select the POP type. Type in exchange.charter-business.net in the Incoming Server field. 5. Click Next > to proceed to the next step of the Wizard. The User Names Wizard step is displayed. Type in (your full address) in the Incoming User Name field. 6. Click Next > to continue. The Account Name Wizard step is displayed. Type in the reference name for your account, for example Work Account in the Account Name field. 7. Click Next > to proceed to the final Wizard step. The summary information is displayed. Check if everything is correct. 8. Click Finish to complete the Wizard. Your POP3 account is now created. 9. On the Thunderbird menu, select Tools > Account Settings to display the Account Settings dialog window. 6 10. In the folder list, select the account you just created and click Server Settings. The incoming server settings for your account are displayed at the right side of the Account Settings window. 11. Under Security Settings select SSL. 12. In the folder list of the Account Setting window, click Outgoing Server (SMTP). 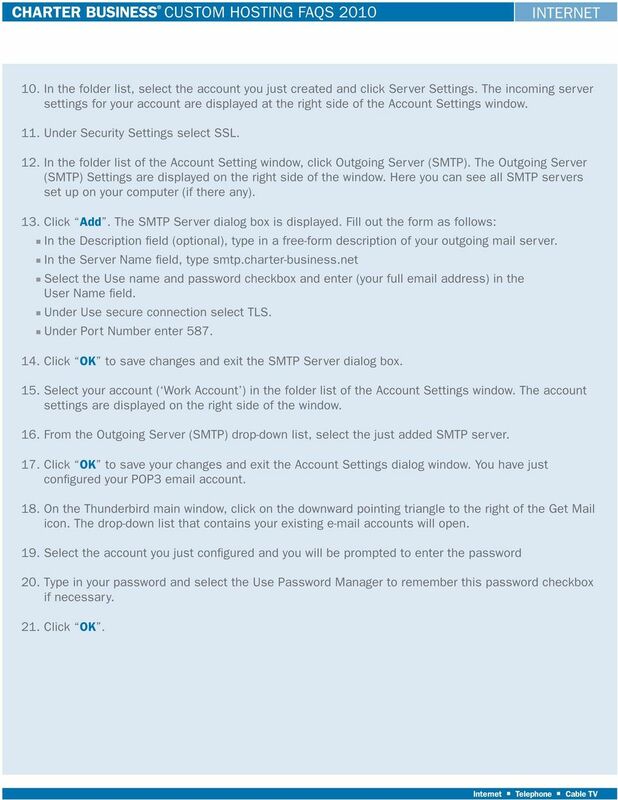 The Outgoing Server (SMTP) Settings are displayed on the right side of the window. Here you can see all SMTP servers set up on your computer (if there any). 13. Click Add. The SMTP Server dialog box is displayed. Fill out the form as follows: In the Description field (optional), type in a free-form description of your outgoing mail server. In the Server Name field, type smtp.charter-business.net Select the Use name and password checkbox and enter (your full address) in the User Name field. Under Use secure connection select TLS. 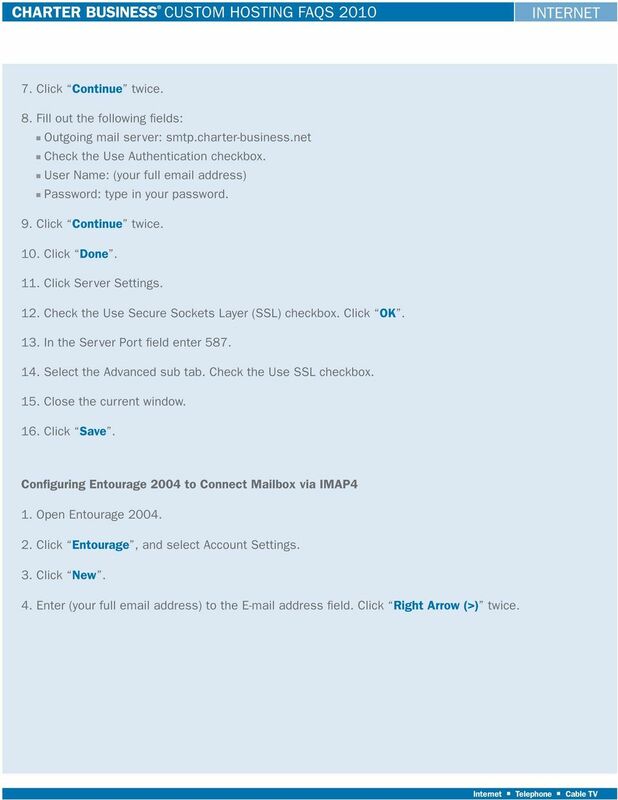 Under Port Number enter Click OK to save changes and exit the SMTP Server dialog box. 15. Select your account ( Work Account ) in the folder list of the Account Settings window. The account settings are displayed on the right side of the window. 16. From the Outgoing Server (SMTP) drop-down list, select the just added SMTP server. 17. Click OK to save your changes and exit the Account Settings dialog window. You have just configured your POP3 account. 18. On the Thunderbird main window, click on the downward pointing triangle to the right of the Get Mail icon. The drop-down list that contains your existing accounts will open. 19. Select the account you just configured and you will be prompted to enter the password 20. Type in your password and select the Use Password Manager to remember this password checkbox if necessary. 21. Click OK.
7 Configuring Apple Mail 2 to Connect Mailbox via POP3 1. Open Apple Mail Click Mail, and select Preferences. 3. Click the plus sign (+) at the bottom to add a new account. 4. Set Account Type as POP and fill out the following fields: Enter Account Description. Enter your name in Full Name field. Enter (your full address) to the Address field. 5. Click Continue. 6. Fill out the following fields: Your Name: type in your name that will be shown to your recipients in the From field. Incoming mail server: exchange.charter-business.net User Name: (your full address) Password: type in your password. 7. Click Continue twice. 8. 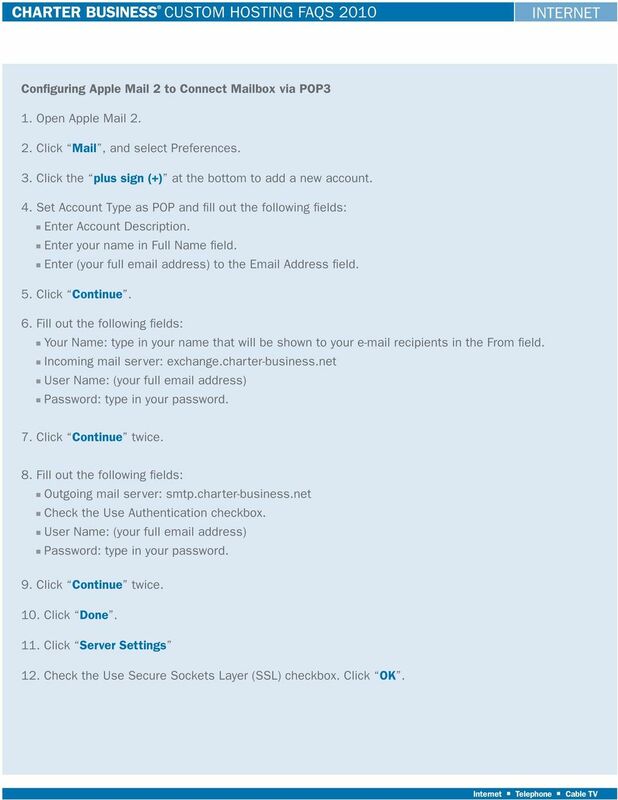 Fill out the following fields: Outgoing mail server: smtp.charter-business.net Check the Use Authentication checkbox. User Name: (your full address) Password: type in your password. 9. Click Continue twice. 10. Click Done. 11. Click Server Settings 12. Check the Use Secure Sockets Layer (SSL) checkbox. Click OK.
8 13. In the Server Port field enter Select the Advanced sub tab and check the Use SSL checkbox. 15. Close the current window. 16. Click Save. Configuring Entourage 2004 to Connect Mailbox via POP3 1. Open Entourage Click Entourage, and select Account Settings. 3. Click New. 4. Enter (your full address) to the address field. Click on Right Arrow (>) twice. 5. Fill out the following fields: Enter your name in Your Name field. Enter (your full address) in the Account ID field. Enter your Mailbox Password in the Password field. Check the Save password in Mac OS X Keychain checkbox. 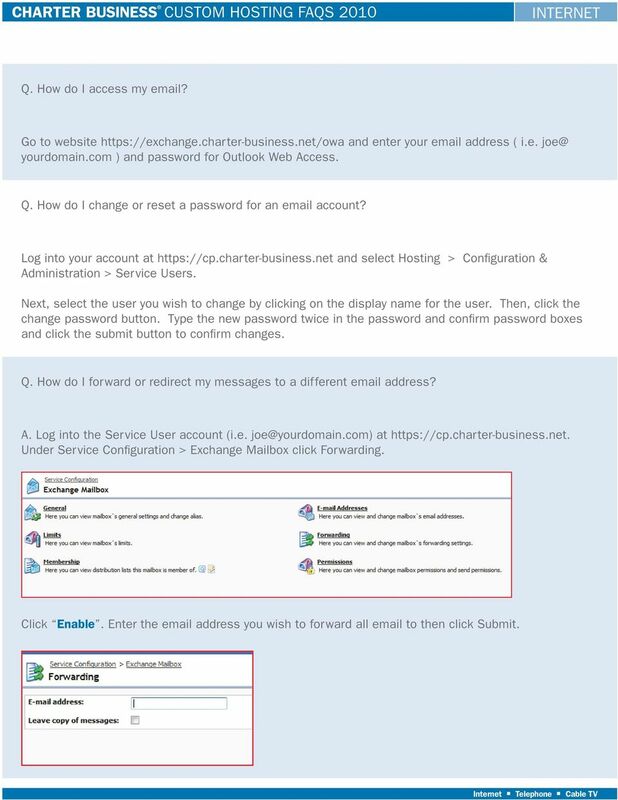 Enter exchange.charter-business.net in the Incoming mail server field. Set Incoming mail server type as POP. Enter smtp.charter-business.net in the Outgoing mail server field. 6. Click on Right Arrow (>) twice. 7. Click Skip. 8. Enter name of account in the Account name field and click Finish. 9. Click on the POP3 Account you just created in the Accounts window. 10. Press Click here for advanced receiving options. 9 11. 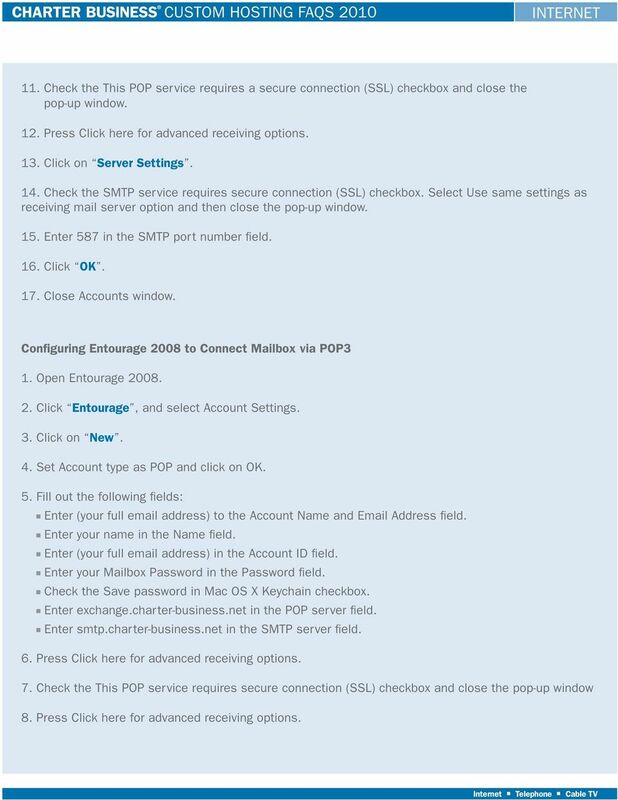 Check the This POP service requires a secure connection (SSL) checkbox and close the pop-up window. 12. Press Click here for advanced receiving options. 13. Click on Server Settings. 14. Check the SMTP service requires secure connection (SSL) checkbox. Select Use same settings as receiving mail server option and then close the pop-up window. 15. Enter 587 in the SMTP port number field. 16. Click OK. 17. Close Accounts window. 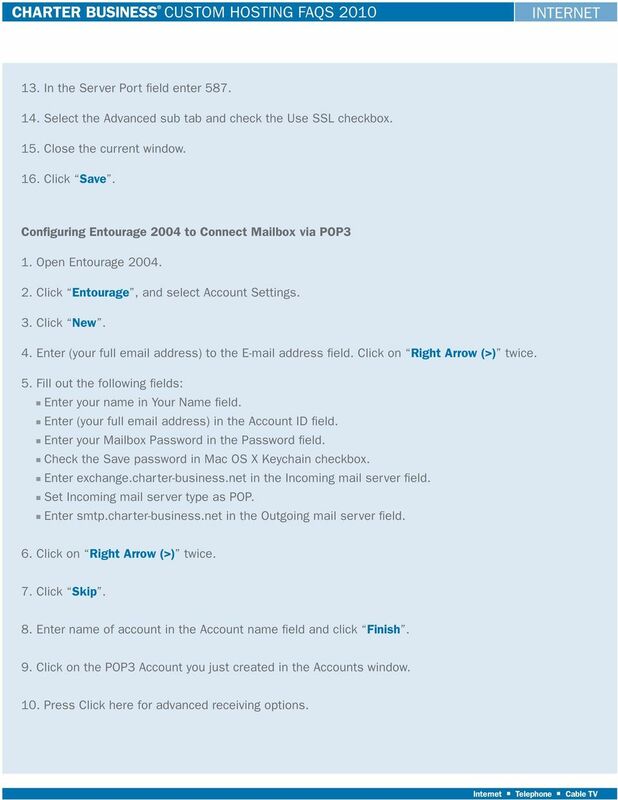 Configuring Entourage 2008 to Connect Mailbox via POP3 1. Open Entourage Click Entourage, and select Account Settings. 3. Click on New. 4. Set Account type as POP and click on OK. 5. Fill out the following fields: Enter (your full address) to the Account Name and Address field. Enter your name in the Name field. Enter (your full address) in the Account ID field. Enter your Mailbox Password in the Password field. Check the Save password in Mac OS X Keychain checkbox. Enter exchange.charter-business.net in the POP server field. Enter smtp.charter-business.net in the SMTP server field. 6. Press Click here for advanced receiving options. 7. Check the This POP service requires secure connection (SSL) checkbox and close the pop-up window 8. Press Click here for advanced receiving options. 10 9. Check the SMTP service requires secure connection (SSL) checkbox, select Use same settings as receiving mail server option and close the pop-up window. 10. Enter 587 in the SMTP port number field. 11. Click OK. 12. Close the Accounts window. 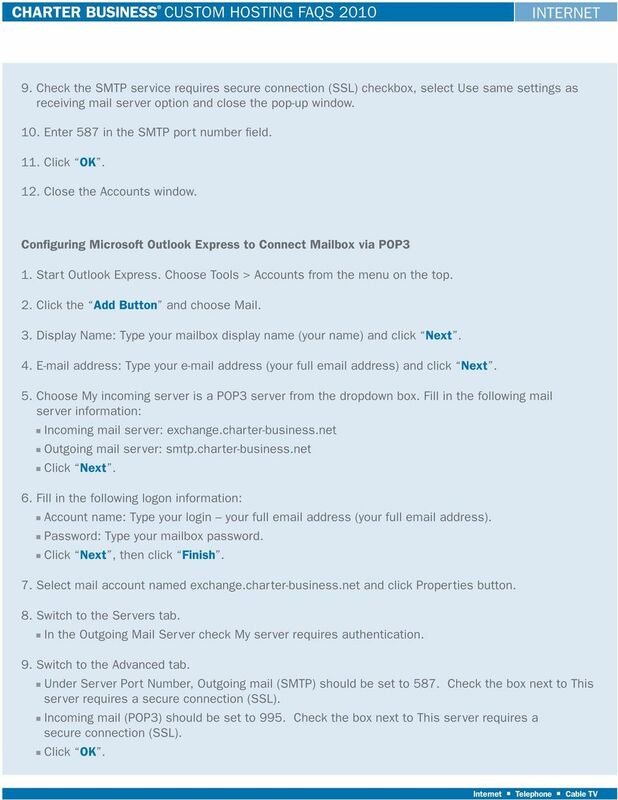 Configuring Microsoft Outlook Express to Connect Mailbox via POP3 1. Start Outlook Express. Choose Tools > Accounts from the menu on the top. 2. Click the Add Button and choose Mail. 3. Display Name: Type your mailbox display name (your name) and click Next. 4. address: Type your address (your full address) and click Next. 5. Choose My incoming server is a POP3 server from the dropdown box. Fill in the following mail server information: Incoming mail server: exchange.charter-business.net Outgoing mail server: smtp.charter-business.net Click Next. 6. Fill in the following logon information: Account name: Type your login your full address (your full address). Password: Type your mailbox password. Click Next, then click Finish. 7. 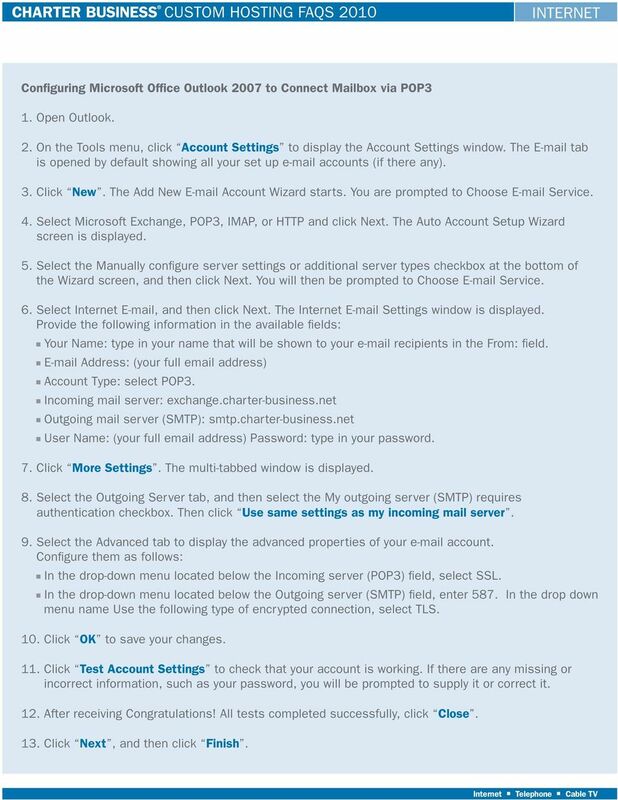 Select mail account named exchange.charter-business.net and click Properties button. 8. Switch to the Servers tab. In the Outgoing Mail Server check My server requires authentication. 9. Switch to the Advanced tab. Under Server Port Number, Outgoing mail (SMTP) should be set to 587. Check the box next to This server requires a secure connection (SSL). Incoming mail (POP3) should be set to 995. Check the box next to This server requires a secure connection (SSL). Click OK.
11 Configuring Microsoft Office Outlook 2007 to Connect Mailbox via POP3 1. Open Outlook. 2. On the Tools menu, click Account Settings to display the Account Settings window. The tab is opened by default showing all your set up accounts (if there any). 3. Click New. The Add New Account Wizard starts. You are prompted to Choose Service. 4. Select Microsoft Exchange, POP3, IMAP, or HTTP and click Next. 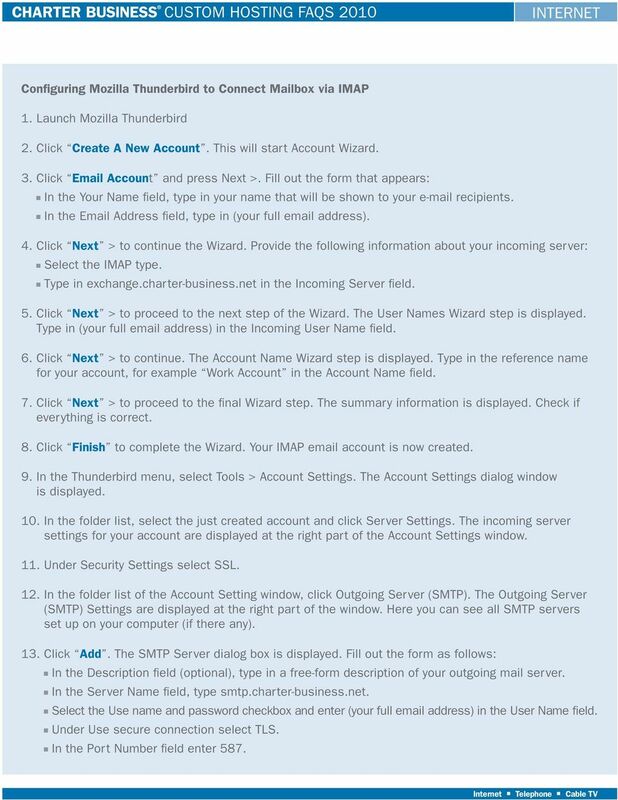 The Auto Account Setup Wizard screen is displayed. 5. Select the Manually configure server settings or additional server types checkbox at the bottom of the Wizard screen, and then click Next. You will then be prompted to Choose Service. 6. Select Internet , and then click Next. The Internet Settings window is displayed. Provide the following information in the available fields: Your Name: type in your name that will be shown to your recipients in the From: field. Address: (your full address) Account Type: select POP3. Incoming mail server: exchange.charter-business.net Outgoing mail server (SMTP): smtp.charter-business.net User Name: (your full address) Password: type in your password. 7. Click More Settings. The multi-tabbed window is displayed. 8. Select the Outgoing Server tab, and then select the My outgoing server (SMTP) requires authentication checkbox. Then click Use same settings as my incoming mail server. 9. Select the Advanced tab to display the advanced properties of your account. Configure them as follows: In the drop-down menu located below the Incoming server (POP3) field, select SSL. 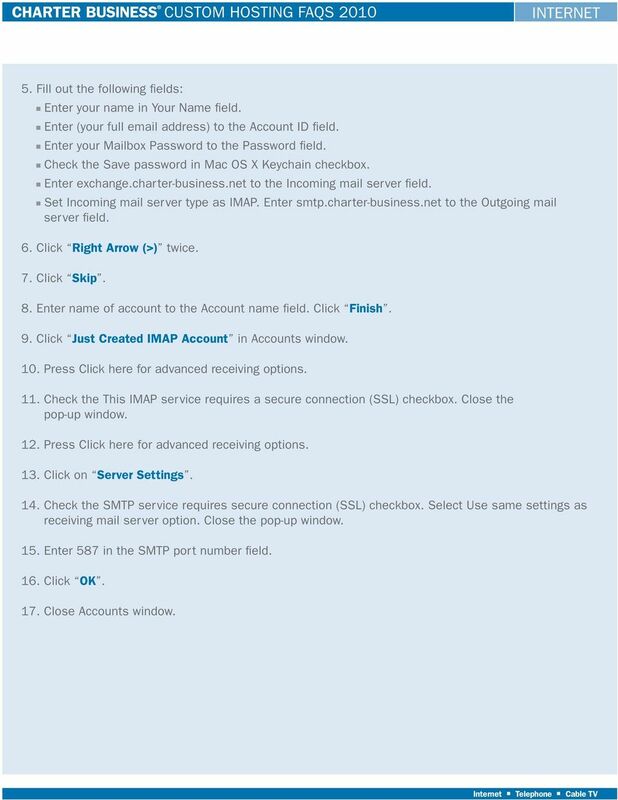 In the drop-down menu located below the Outgoing server (SMTP) field, enter 587. In the drop down menu name Use the following type of encrypted connection, select TLS. 10. Click OK to save your changes. 11. 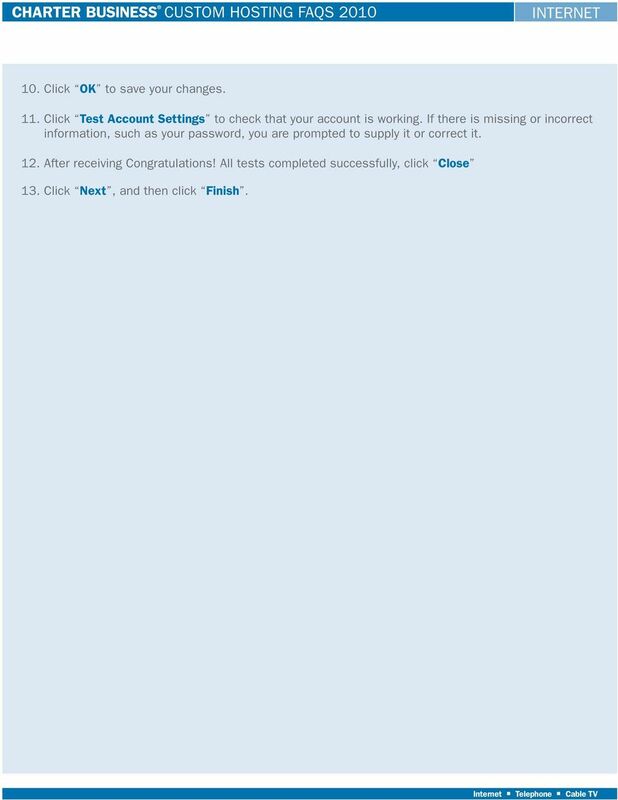 Click Test Account Settings to check that your account is working. If there are any missing or incorrect information, such as your password, you will be prompted to supply it or correct it. 12. After receiving Congratulations! All tests completed successfully, click Close. 13. Click Next, and then click Finish. 12 Configuring Mozilla Thunderbird to Connect Mailbox via IMAP 1. Launch Mozilla Thunderbird 2. Click Create A New Account. This will start Account Wizard. 3. Click Account and press Next >. Fill out the form that appears: In the Your Name field, type in your name that will be shown to your recipients. In the Address field, type in (your full address). 4. Click Next > to continue the Wizard. Provide the following information about your incoming server: Select the IMAP type. Type in exchange.charter-business.net in the Incoming Server field. 5. Click Next > to proceed to the next step of the Wizard. The User Names Wizard step is displayed. Type in (your full address) in the Incoming User Name field. 6. Click Next > to continue. The Account Name Wizard step is displayed. Type in the reference name for your account, for example Work Account in the Account Name field. 7. Click Next > to proceed to the final Wizard step. The summary information is displayed. Check if everything is correct. 8. Click Finish to complete the Wizard. Your IMAP account is now created. 9. In the Thunderbird menu, select Tools > Account Settings. The Account Settings dialog window is displayed. 10. In the folder list, select the just created account and click Server Settings. The incoming server settings for your account are displayed at the right part of the Account Settings window. 11. Under Security Settings select SSL. 12. In the folder list of the Account Setting window, click Outgoing Server (SMTP). 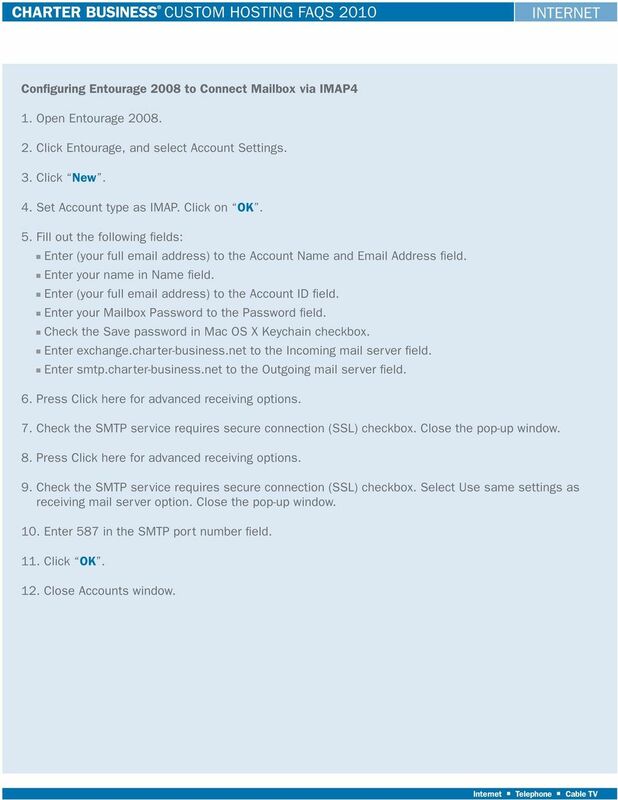 The Outgoing Server (SMTP) Settings are displayed at the right part of the window. Here you can see all SMTP servers set up on your computer (if there any). 13. Click Add. The SMTP Server dialog box is displayed. Fill out the form as follows: In the Description field (optional), type in a free-form description of your outgoing mail server. In the Server Name field, type smtp.charter-business.net. Select the Use name and password checkbox and enter (your full address) in the User Name field. Under Use secure connection select TLS. In the Port Number field enter 587. 13 14. Click OK to save changes and exit the SMTP Server dialog box. 15. Select your account ( Work Account ) in the folder list of the Account Settings window. The account settings are displayed at the right part of the window. 16. From the Outgoing Server (SMTP) drop-down list, select the just added SMTP server. 17. Click OK to save your changes and exit the Account Settings dialog window. You have just configured your IMAP account. 18. On the Thunderbird main window, click on the down-oriented triangle to the right of the Get Mail icon. The drop-down list opens contains your existing accounts will open. 19. Select the just configured account and you will be prompted to enter the password. 20. Type in your password and select the Use Password Manager to remember this password checkbox if necessary. 21. 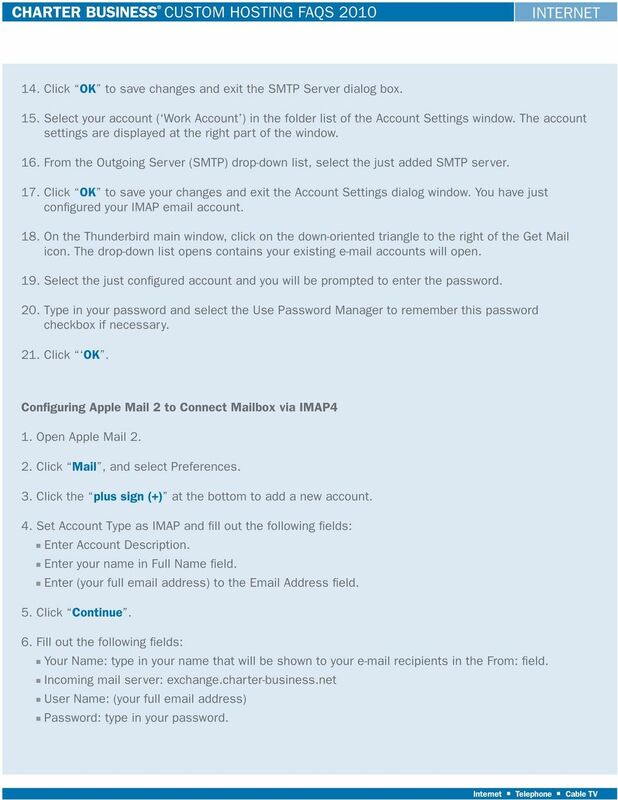 Click OK. Configuring Apple Mail 2 to Connect Mailbox via IMAP4 1. Open Apple Mail Click Mail, and select Preferences. 3. Click the plus sign (+) at the bottom to add a new account. 4. Set Account Type as IMAP and fill out the following fields: Enter Account Description. Enter your name in Full Name field. Enter (your full address) to the Address field. 5. Click Continue. 6. Fill out the following fields: Your Name: type in your name that will be shown to your recipients in the From: field. Incoming mail server: exchange.charter-business.net User Name: (your full address) Password: type in your password. 14 7. Click Continue twice. 8. 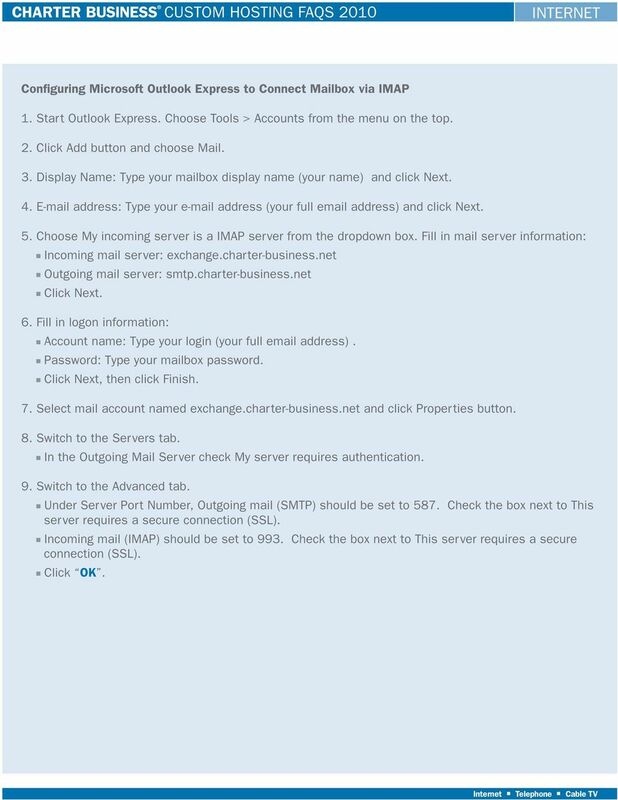 Fill out the following fields: Outgoing mail server: smtp.charter-business.net Check the Use Authentication checkbox. User Name: (your full address) Password: type in your password. 9. Click Continue twice. 10. Click Done. 11. Click Server Settings. 12. Check the Use Secure Sockets Layer (SSL) checkbox. Click OK. 13. In the Server Port field enter Select the Advanced sub tab. Check the Use SSL checkbox. 15. Close the current window. 16. Click Save. 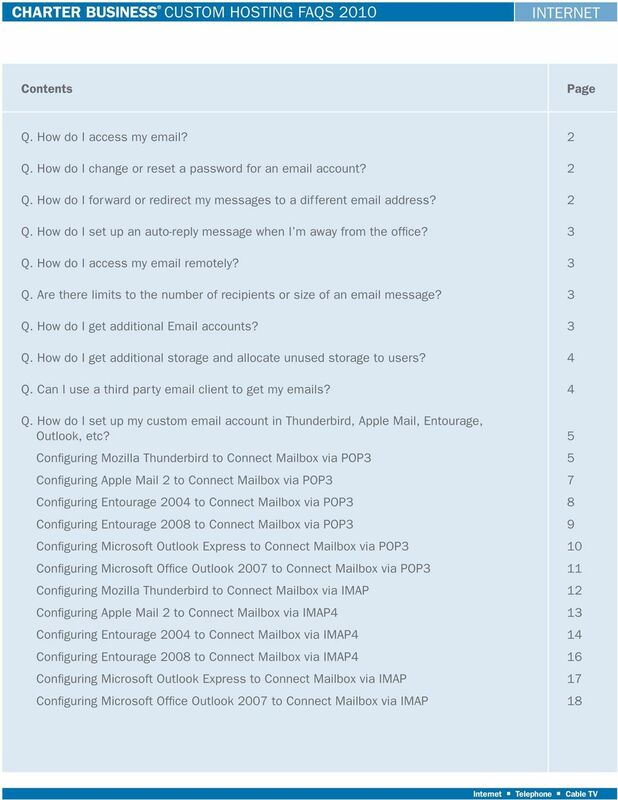 Configuring Entourage 2004 to Connect Mailbox via IMAP4 1. Open Entourage Click Entourage, and select Account Settings. 3. Click New. 4. Enter (your full address) to the address field. Click Right Arrow (>) twice. 15 5. Fill out the following fields: Enter your name in Your Name field. Enter (your full address) to the Account ID field. Enter your Mailbox Password to the Password field. Check the Save password in Mac OS X Keychain checkbox. Enter exchange.charter-business.net to the Incoming mail server field. Set Incoming mail server type as IMAP. Enter smtp.charter-business.net to the Outgoing mail server field. 6. Click Right Arrow (>) twice. 7. Click Skip. 8. Enter name of account to the Account name field. Click Finish. 9. Click Just Created IMAP Account in Accounts window. 10. Press Click here for advanced receiving options. 11. Check the This IMAP service requires a secure connection (SSL) checkbox. Close the pop-up window. 12. Press Click here for advanced receiving options. 13. Click on Server Settings. 14. Check the SMTP service requires secure connection (SSL) checkbox. Select Use same settings as receiving mail server option. Close the pop-up window. 15. Enter 587 in the SMTP port number field. 16. Click OK. 17. Close Accounts window. 16 Configuring Entourage 2008 to Connect Mailbox via IMAP4 1. Open Entourage Click Entourage, and select Account Settings. 3. Click New. 4. Set Account type as IMAP. Click on OK. 5. Fill out the following fields: Enter (your full address) to the Account Name and Address field. Enter your name in Name field. Enter (your full address) to the Account ID field. Enter your Mailbox Password to the Password field. Check the Save password in Mac OS X Keychain checkbox. Enter exchange.charter-business.net to the Incoming mail server field. Enter smtp.charter-business.net to the Outgoing mail server field. 6. Press Click here for advanced receiving options. 7. Check the SMTP service requires secure connection (SSL) checkbox. Close the pop-up window. 8. Press Click here for advanced receiving options. 9. Check the SMTP service requires secure connection (SSL) checkbox. Select Use same settings as receiving mail server option. Close the pop-up window. 10. Enter 587 in the SMTP port number field. 11. Click OK. 12. Close Accounts window. 17 Configuring Microsoft Outlook Express to Connect Mailbox via IMAP 1. Start Outlook Express. Choose Tools > Accounts from the menu on the top. 2. Click Add button and choose Mail. 3. Display Name: Type your mailbox display name (your name) and click Next. 4. address: Type your address (your full address) and click Next. 5. Choose My incoming server is a IMAP server from the dropdown box. Fill in mail server information: Incoming mail server: exchange.charter-business.net Outgoing mail server: smtp.charter-business.net Click Next. 6. Fill in logon information: Account name: Type your login (your full address). Password: Type your mailbox password. Click Next, then click Finish. 7. 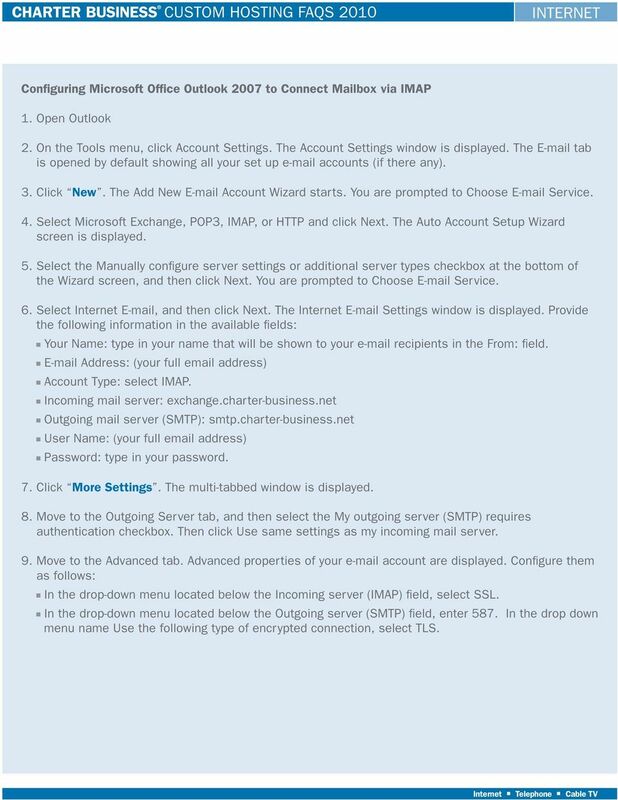 Select mail account named exchange.charter-business.net and click Properties button. 8. Switch to the Servers tab. In the Outgoing Mail Server check My server requires authentication. 9. Switch to the Advanced tab. Under Server Port Number, Outgoing mail (SMTP) should be set to 587. Check the box next to This server requires a secure connection (SSL). Incoming mail (IMAP) should be set to 993. Check the box next to This server requires a secure connection (SSL). Click OK.
18 Configuring Microsoft Office Outlook 2007 to Connect Mailbox via IMAP 1. Open Outlook 2. On the Tools menu, click Account Settings. The Account Settings window is displayed. The tab is opened by default showing all your set up accounts (if there any). 3. Click New. The Add New Account Wizard starts. You are prompted to Choose Service. 4. Select Microsoft Exchange, POP3, IMAP, or HTTP and click Next. 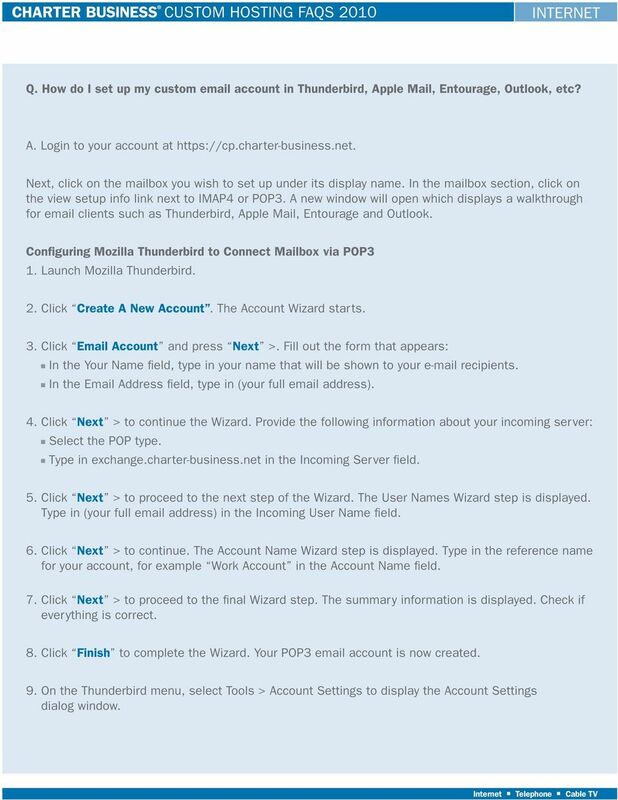 The Auto Account Setup Wizard screen is displayed. 5. Select the Manually configure server settings or additional server types checkbox at the bottom of the Wizard screen, and then click Next. You are prompted to Choose Service. 6. Select Internet , and then click Next. The Internet Settings window is displayed. Provide the following information in the available fields: Your Name: type in your name that will be shown to your recipients in the From: field. Address: (your full address) Account Type: select IMAP. Incoming mail server: exchange.charter-business.net Outgoing mail server (SMTP): smtp.charter-business.net User Name: (your full address) Password: type in your password. 7. Click More Settings. The multi-tabbed window is displayed. 8. Move to the Outgoing Server tab, and then select the My outgoing server (SMTP) requires authentication checkbox. Then click Use same settings as my incoming mail server. 9. Move to the Advanced tab. Advanced properties of your account are displayed. Configure them as follows: In the drop-down menu located below the Incoming server (IMAP) field, select SSL. In the drop-down menu located below the Outgoing server (SMTP) field, enter 587. In the drop down menu name Use the following type of encrypted connection, select TLS. 19 10. Click OK to save your changes. 11. Click Test Account Settings to check that your account is working. If there is missing or incorrect information, such as your password, you are prompted to supply it or correct it. 12. After receiving Congratulations! All tests completed successfully, click Close 13. Click Next, and then click Finish.